The Central Presbyterian Church Holiday Market is an annual fundraiser to support Central’s mission efforts, locally and across the world. This will be great time to finish your holiday shopping and support a good cause. We can offer two people to speak on both the Holiday Market and the Holly & Ivy tour. 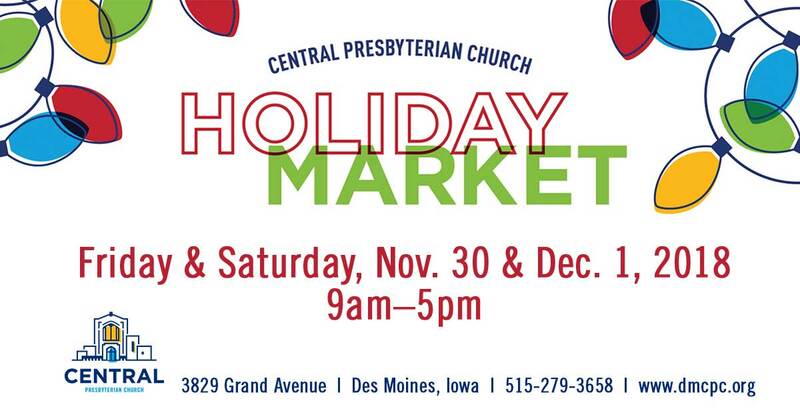 Dates and location for the Holiday Market are: Friday, Nov. 30, 9am–5pm and Saturday, Dec. 1, 9am–5pm, at Central Presbyterian Church, 3829 Grand Ave., Des Moines, Iowa. For details, visit our website, www.dmcpc.org/holiday-market/. Free and open to the public, the 2018 Holiday Market is sure to be a fun time for all! There will be an affordable lunch offered for $5 and includes your choice of soup and bread. Beverages and homemade desserts can be purchased separately to fuel your Christmas shopping! Our partner event, the Holly & Ivy Home Tour, showcases the Salisbury House & Gardens and along with two private homes, all transformed in holiday grandeur November 30 through December 2, from 11:00 a.m.–4:00 p.m. Purchase tickets at www.salisburyhouse.org or call 515-274-1777.